Take an improv class in a fun, professional and safe environment at The Philadelphia School of Improv. Check out our curriculum and sign up early to save $$ on enrollment! Are you looking for an improv class in Philadelphia? Then you are in the right place. Welcome to The Philadelphia School of Improv! This is the improv school for CSz Philadelphia. Our goal is to share the 25+ years of improv experience with our students and provide them opportunities that they can use to grow as improvisers. For over a quarter of a century, ComedySportz has used improvisation and comedy to entertain thousands of Loyal Fans. We took that experience and applied it to our curriculum creating multiple levels of fun, exciting, and supportive training. Our Instructors are professional performers, actors, teachers and coaches performing in theaters and comedy groups around Philadelphia. Scroll down and see what we have to offer. Recess is in session. Sign up by the Early Bird Deadline (see above) and you’ll receive the biggest discount. If you sign up after that date, you’ll still get a discount, but not as big. If you sign up on the day of the class, you’ll pay full price. You can also put a $100 deposit down and pay the difference on the first day of class! Please Note: The deposit is non-refundable. Sign up for more than one class per semester and you’ll get a 15% discount on all secondary classes. Email or call us for details. CSz Philly is proud to offer scholarships to the diverse population of Philadelphia. If you would like to apply for a Diversity Scholarship, please click below. Improv uses the same basic skill set regardless of what format or form you are doing. That being said each form uses a different muscle and we believe, to be well-rounded performer, you should be exercising as many improv muscles as possible. That is why we offer classes on multiple forms. Find which one appeals to you as a performer and start there. You want to perform improv like the Players in ComedySportz? Then this is the track for you! You’ll learn the basics and apply them to our game-based format of improv that is faster and varied in style. Have you seen a show at the Upright Citizens Brigade or The Improv Olympic in Chicago? If you want to do improv like these popular comedy theaters, then this track is for you. Learn the basics and then apply them to grounded, scene-based improv. When you graduate Long Form 301, you are able to audition for our Long Form House Teams and perform in a 3-month run of a weekly show. You’re an experienced improviser looking to try a new form and get on stage; this is the track for you. You’ll spend the first 4 weeks working on the form and the second 4 weeks performing in front of an audience. Each performance is followed by a notes session with the Instructor. Prerequisite: Improv 301 or higher from CSz Philadelphia or anther training center. You've worked hard for 8 weeks, time to show off your stuff. All classes end with a Showcase for invited friends and family. Whether you want to grow as a performer, get better at public speaking, or just make new friends -- we have your back! From your initial ice breaker to your final class show, our curriculum and expert instructors are there to support your growth as an improviser every step of the way. We'll start you with the basics in 101 and get you comfortable with taking risks and playing some of our favorite improv games . In our 201 class, we expand into scenework, teaching you how to build a scene and support your scene partner. By 301, you have the tools to start creating fun, crazy and real characters. We'll show you how to use them in your scenes and games. In 401, we combine all of the elements and apply it our performance philosophy. When you graduate 401, you are able to join The Rec League! This is where you get to play a monthly ComedySportz match in our home arena for friends and family. In 101 you’ll start with the fundamentals (it’s like the basics but more syllables): agreement (“yes, and-ing”), active listening, commitment, and being present in the moment. You will then start to apply these skills to scene work . In 201, students will dive deeper into scene work, explore second beats, explore tag-outs and callbacks, learn different openings, and practice different approaches to improv, such as finding, playing, and heightening the game of the scene. Students will get to perform what they have learned in a class show for family and friends. In 301, students will focus on the Harold, the most renowned long form structure, developed by Del Close. In this class, students will learn about this long form structure and why it works, how to play group games, how to do a great run, and how to put the whole thing together. Students will get to perform the entire Harold for their class show. In 401, students will explore advanced improv forms. In this class, students will sharpen their scene work, heightening, listening, and callbacks, while diving deep into other long form structures. This class will culminate in two class shows, and students will get to perform one or more of the forms that they have worked on. When you graduate 301, you are able to audition for our Long Form House Teams and perform in a 6-month run of a weekly show. All classes and performances happen right in our home arena. Our students also receive some excellent perks including, free open practices, end of class showcase for family and friends and FREE admission to see ComedySportz. What is Short Form Improv? While several acting traditions throughout world history have employed improvisation as a method of actor training, American Short-Form may well be the first time a group of actors have ever stood on a stage ready to act with no pre-planned ideas of what their resulting scenes would depict. Short Form takes the principles of improv and applies it to games and scenes. 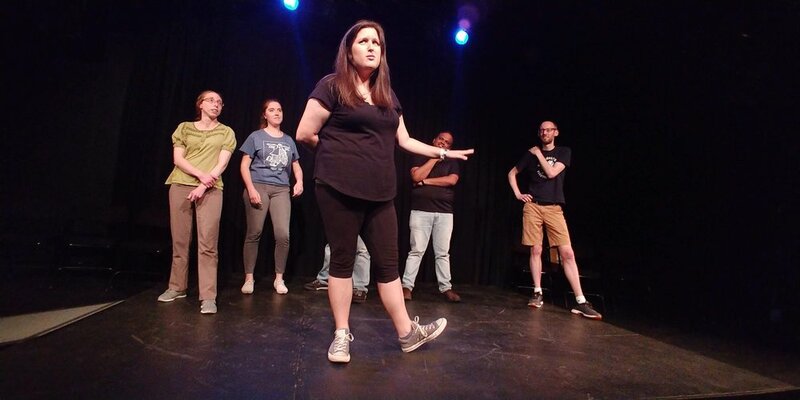 Some games are scene-based, some are character-based, some are gimmick-based, but all use the improv skills that we teach you in each level of our classes: commitment, heightening and decision making. Short Form improvisation is used in popular and successful shows like Who’s Line Is It Anyway? and ComedySportz. It is also particularly effective in the game of life.